Some of my best childhood memories include day trips to Vicksburg, Mississippi and its Civil War battleground. We would pack a picnic lunch and load the station wagon, then hit the road and arrive right at lunch time. After eating a sandwich and downing a Shasta cola, we were ready to tour the battlefield. This usually involved sitting on the tailgate of a pickup truck and riding slowly through the park–jumping on and off at each monument and historical marker. We rode the bronze horses and sat astride the cannons when we weren’t running up the hills and sliding down on big pieces of cardboard. (There were a whole lot fewer rules and regulations back in the 70s.) Sometimes these trips included my family only, but more often than not my parents were chaperoning the church youth group. The one constant throughout my visits to Vicksburg was the wide, rolling Mississippi River which flowed past the park in majestic splendor. I was fascinated by the knowledge that it stretched for hundreds of miles, and imagined what it would be like to travel its length on a paddlewheel riverboat like Mark Twain had done. I also tried to imagine what it would be like to wake up one morning and discover that the massive river had changed course during the night! 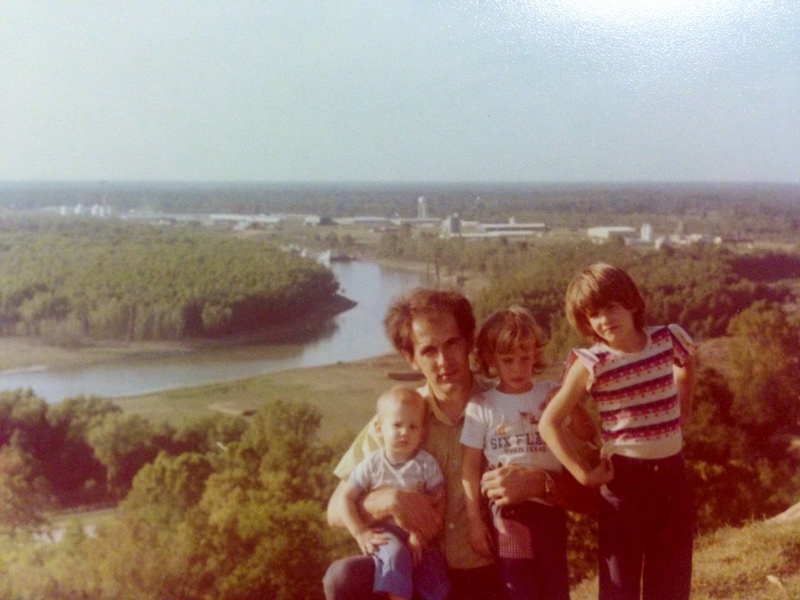 This photo shows me (when I was about seven) with my dad, sister, and brother.